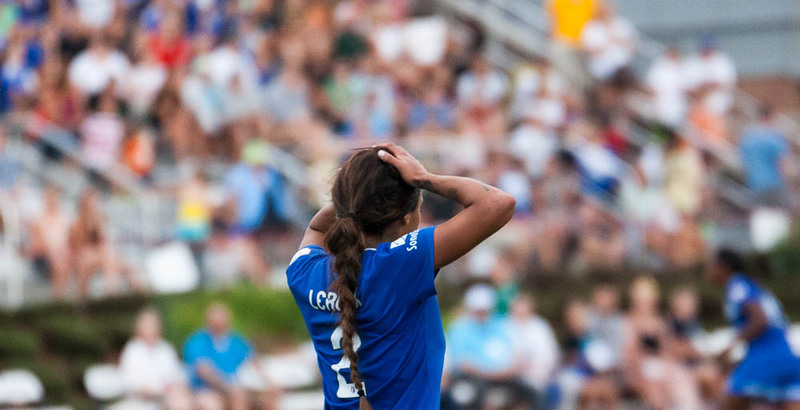 SOMERVILLE, Mass- Cat Whitehill’s coaching debut did not go as planned for the Breakers, as they gave up a two-goal lead late and tied the Western New York Flash 2-2 at Dilboy Stadium on Saturday night in front of 2,899. Whitehill, who filled the role of player-coach after Lisa Cole departed the club on Friday, helped the Breakers open the scoring in the 17th minute, playing a cross into the penalty area that Kyah Simon volleyed home. Lianne Sanderson doubled the lead in the 65th minute off a corner kick by Heather O’Reilly. But the Flash’s Vicki DiMartino and Carli Lloyd both scored within eight minutes of one another late in the second half to take away a key result for the Breakers. Although Whitehill said after Saturday’s game that she one day sees herself coaching full-time, she did not expect to be counted upon to play. Fortunately for the veteran defender-turned-coach, former Breakers midfielder/forward Kristine Lilly arrived at Dilboy Stadium to step in and fill the assistant coaching void left by Maren Rojas’ departure. The Breakers’ makeshift coaching duo appeared to be on the right track for most of the game. Boston dominated possession and only rarely allowed the Flash to have a chance at goal. But a series of lapses and conditions that were out of Boston’s control allowed the Flash to crawl their way back into the match. In the 76th minute, Boston midfielder Mariah Nogueira was elbowed by Abby Wambach, forcing her off the field for treatment. Nogueira came back into the game, but only after the Flash pounced on her absence. In the 77th minute, DiMartino curled a shot into the back of the net off a cross from Wambach, who was left all alone to deliver a pass in the area Nogueira had been covering. In the 85th minute, the Flash completed the comeback through Lloyd, who first-timed a shot into the back of the net past the outstretched dive of Breakers goalkeeper Alyssa Naeher. Two minutes off added time were awarded, but the Breakers couldn’t do better than earn the point at home. The tie will feel like a loss to Boston, since they led and dominated for most of the game. They’re not out of the playoffs yet, though they will have to win their last three remaining games to have a chance at clinching a postseason berth. The Breakers have pressure on them and are dealing with a difficult situation. Cole’s departure was bad timing. But the team has put its faith in Whitehill and will attempt to make the most of what remains in the season. Some Breakers players said that they had never been in a situation which saw a teammate step into a coaching role mid-way through the season. Neither has Lilly, whose professional career spanned over 20 years. Player-coaches are rare, but not unheard of. In 2011, Wambach led magicjack to the postseason as a player coach while the club was in turmoil. Whitehill has comparable experience to Wambach, the Breakers aren’t in turmoil, and she seems to have the respect of her teammates. “I’m willing to take it on for this team because I love this team and I love this organization,” said Whitehill. “I love everyone’s encouragement to me. I had so much from my teammates, my friends, and family.